The Delaware County Daily Times Blogs: Sixers Dish: MCW on Nerlens Noel: "I'm definitely going to do everything I can to help him out"
MCW on Nerlens Noel: "I'm definitely going to do everything I can to help him out"
Nerlens Noel thinks Michael Carter-Williams can aid his development next season. Noel, the 76ers center, is coming off a rookie season in which he missed all 82 games while rehabbing his surgically repaired left knee. Carter-Williams is fresh off a rookie campaign in which he put up the type of numbers that will likely garner a Rookie of the Year award. Noel and Carter-Williams, a pair of Boston-area kids, played for the same AAU team in their youth, so they won’t have to develop a camaraderie. Instead, they have to pick up where they left off. The biggest thing for Noel, a 6-11, 230-pounder, is to avoid feeling the pressure of having to live up to Carter-Williams’ big first season as a pro. He led all rookies in points, assists, rebounds and steals and is considered a heavy favorite to win Rookie of the Year. Carter-Williams said his season “takes pressure” off Noel. 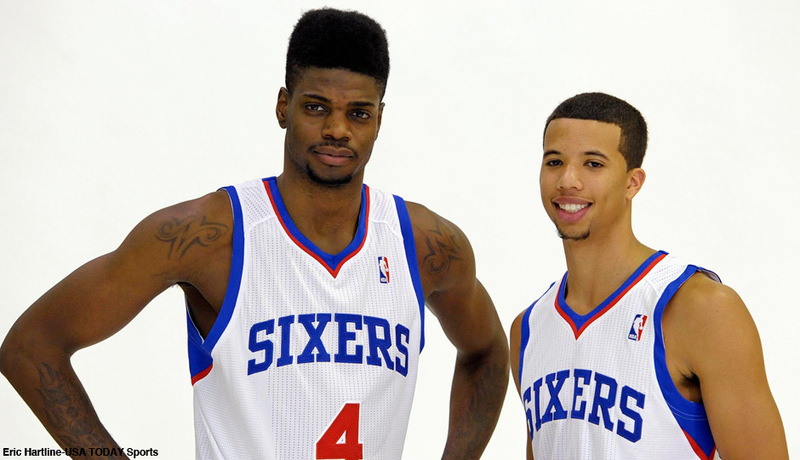 Sixers' Nerlens Noel says he's "100 percent"